We love pizza! We love pizza so much that when we found a cute hut with a clay pizza oven at Netil Market we decided to open our own pizza joint called Death By Pizza. 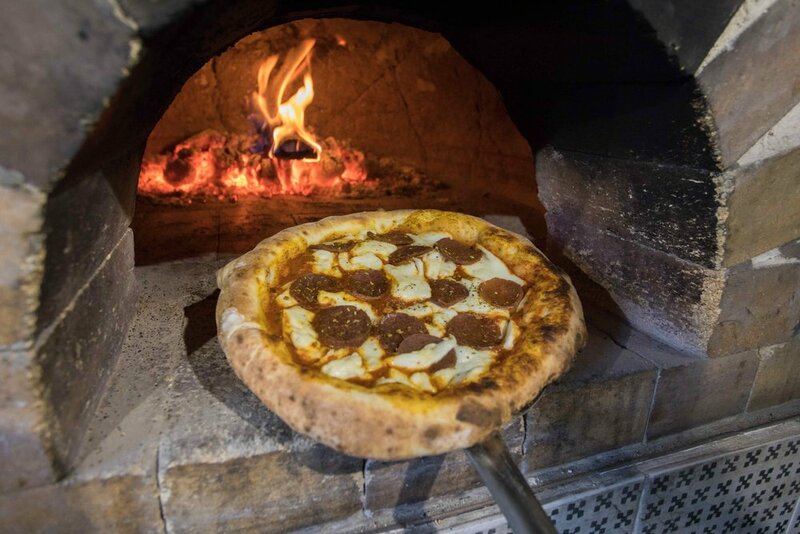 Since opening in Autumn 2018 we have quickly established ourselves as one of London’s favourite pizzerias. Death By Pizza has seating outside and on the roof with a view of London Fields and the surrounding area! There is no need to reserve a spot, just turn up, order and eat. If time is short you can pre order using our collection service and let us know when you would like to collect! Or order delivery straight to your door using our partners Deliveroo or Just Eat. Save time and pre order here. We are unique! We make all ingredients including our vegan mozzarella, mock meats and dough from scratch at our prep kitchen in Camden. That is why we can always guarantee you are eating fresh produce and you will not find anything like it anywhere else.